your writings are so beautiful and it has to be healing therapy to write your thoughts and feelings down. you’re a strong woman and jim and your girls are very lucky to have you. you are all in my prayers. I pray that His comfort, love, and hope sustains you and your family. You are all so loved by God I hope you all can rest in that. Praying for all of you! Please look into homeopathic and alternative medicines. Look up a website by Tamara St. John who healed her cancer. Also consider juicing with organic greens and vegetables to heal his immune system! Praying!!!!!! Jill,you inspire ME. I an a cacer survivor sice 11/23. I had esophagus cacer a still am unablteto eat normal food. Im a longtime fan,live in Rochester ny.Iwill continue to pray for Jim and ur family.I am a recoving alcoholic and live odat. It’s hard for me to read your posts without feeling God’s presence in your writing. Your faith will get you through this like nothing else. I’m sad for you and with you. It’s hard for me to see pictures of a weak Jim Kelly; it must be hard for you and your girls to live it. My prayers to Jim, as you all as well. So glad that you KNOW that God knows what you need, before you need it, strengthens you with strength for each day, that His Spirit within you prays for you even when you can’t, and that Jesus is constantly at His knee interceding for you, Jim and the girls. Our prayers are with you too. Jim was our hero as QB; now he is an even greater hero as a faithful follower of Jesus. God’s peace and blessings to you. Prayers coming your way for your whole family. Your writings are so beautiful! As I was reading I thought how all the question marks and living “one prayer at a time” feels so much like Krabbe. Hunter’s Krabbe brought you to the Son so that you can rest in the FATHER with his daddy’s cancer. Wow. Jesus’ love for you. It’s stunning. Praying, believing, hurting, hoping right alongside you. I’m painting Psalm 91 around the border of Karis’ room right now. I’ll be praying it for Jim, too. Thank you so much for the update. I can’t imagine the struggle your family has gone through. I feel so helpless at times just wishing there was more I could do for Jim as well as for you and the girls. 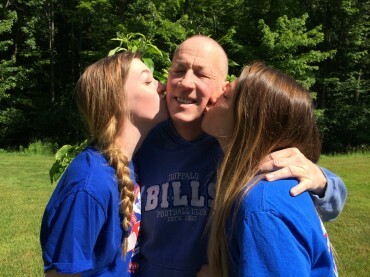 I know you have seen first hand how the world has embraced Jim’s “Kelly Tough” attitude but I hope that you know how many people admire the strength and maturity that you, Erin and Camryn have displayed through all of this. Erin amazes me every time I see her interviews at how mature she is for her young age and the strength and courage that she is facing this with. I know the same is true for you and Camryn. I found myself getting very sad at times through this but also angry at what Jim has had to go through. Angry that cancer can come in and do this and there’s nothing he can do but go through the treatments and wait, all the while hoping and praying. I understand the frustration with trying to figure out God’s plan, but I’m glad that placing your faith in God has brought you some comfort. It’s helped me a lot because there’s no higher power than God and he knows what good and dedicated servant Jim is. Sorry to make this so long. Your family has my continued prayers. God bless you all and give you the strength and faith to see you thru this difficult time. I lostmy hhusband to pancpancreatic cancer and it was only the Grace of God that got me through it and is still with me every day. Just continue to lean on the Lord. Jill, thank you for the updates and please know that I continue to keep Jim, you and you family in my prayers. I can always trust that you will share what is real! And this life is not always easy. I understand! And just as you have helped me over the years I trust God to surround you with those who will be Aaron FOR you… Those who will hold up your arms to the Father and be His embrace for you. We love and pray for you all!! Funny, I used to be a huge fan, and I find myself now saying I am a huge prayer friend. I have been challenged lately by the attribute of God describing his ever present presence. His great power, his ability to be and do and see everything…1 Chron. 29:11-13.